Unless you’ve been hiding under a rock on a distant planet where Earthly legal decisions aren’t of note, you know that the Supreme Court finally ruled that marriage equality is now law all over the United States. And while many have celebrated the historic ruling, many others have been obstinately critical of it, like one man who took his disgust to his local NBC affiliate for changing their logo to reflect gay pride…except they didn’t, and it’s the same peacock logo the network has always had. Guess this guy doesn’t do the whole Must See TV thing. 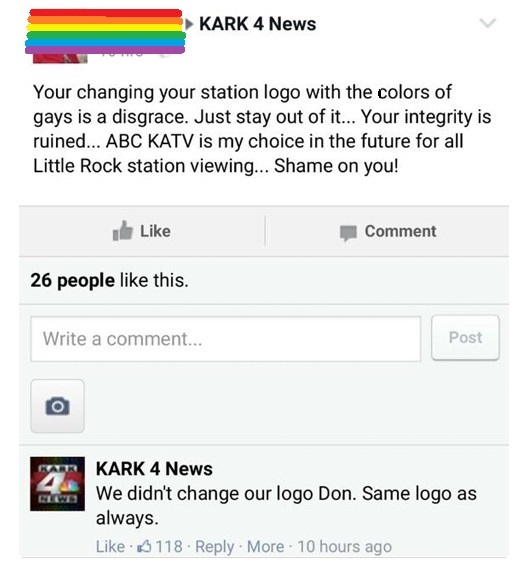 A presumed Arkansas resident, whose name we’re mostly removing even though you can find it elsewhere on the Internet, totally harangued Little Rock’s KARK-TV recently for what he assumed was a politically motivated logo change, not quite realizing that NBC hasn’t changed its logo in at least a bazillion years. Here was his complaint on Facebook, as captured by Barstool Sports. Obviously this man can’t only be mad at this NBC station for performing what he feels is an integrity-ruining act. I wonder what else he’s angry with. 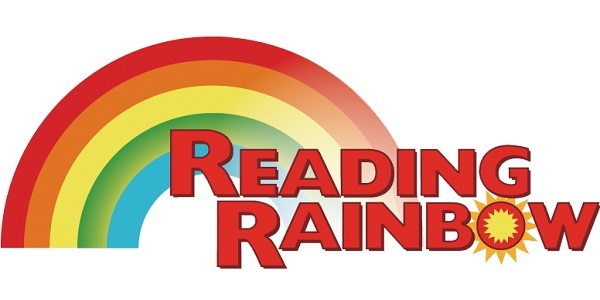 He’s probably really pissed at Reading Rainbow for not just the colorful logo but the name as well. How dare Levar Burton get involved with such a program? I bet all they read is fan fiction romances between Gandolf and Dumbledore. 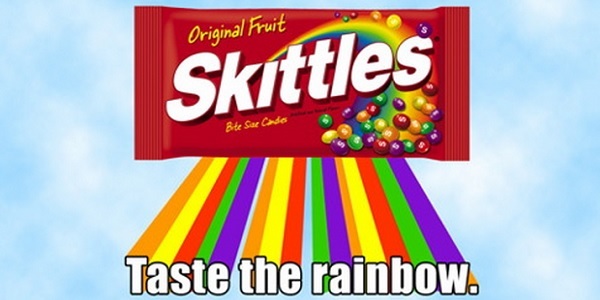 Skittles is one of the more popular candies in the country, so why on Earth would Mars, Inc. decide to change their marketing campaign and candy color combination to reflect that of America’s growing acceptance of all sexualities being able to wed? 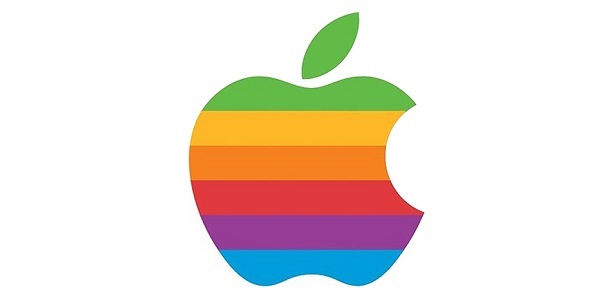 And then there’s Apple, with their rainbow logo. It’s ridiculous that they should have gone with this logo from the late 1970s to the early 1990s, decades before the Supreme Court would deliver such a life-changing verdict. That Steve Jobs and his revolutionary ideas. Perhaps now this guy will start paying closer attention to the things he watches, as well as what he decides to spout off about on the Internet.